Summer = Sunshine = Solar Energy for Microbes! Hi everyone! 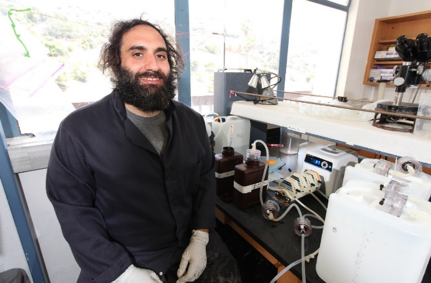 My name is Babak and I’m a third year PhD student at USC’s Marine Biology and Biological Oceanography program. As you may have already guessed from the title of my blog, I study antennae that microbes use to capture solar energy. Another word for these antennae is pigments. 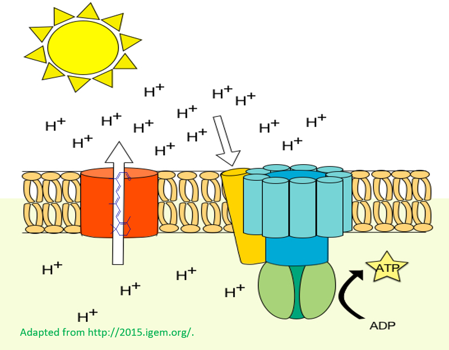 Pigments are embedded in cells’ photosystems and allow them to convert sunlight into biologically useful energy. You may have heard of chlorophyll a (chl a), the pigment that makes most terrestrial plants green. It allows them to make sugars from CO2 and creates oxygen for other organisms to breathe (photosynthesis). This same pigment, chl a, is responsible for photosynthesis in the open ocean which is primarily carried out by single cell organisms (bacteria and phytoplankton). Interestingly, about half of the oxygen that exists in our atmosphere comes from these microscopic organisms in the ocean! Another pigment that I study for my research is actually more abundant than chlorophyll in marine bacteria! It is called Proteorhodopsin (PR, figure 1) and was unknown of in marine systems until the year 2000! Over 80% of all bacteria have the gene for PR and they can use it to capture light from the sun and make ATP for their cellular needs. PR is a much less studied pigment compared to chlorophyll and one of the main goals of our lab and my PhD dissertation is to quantify the abundance of this pigment in different marine regimes and investigate the environmental factors that control its distribution. My goal this summer was to study day-night (diel) cycles of pigment concentrations offshore Catalina Island. This is important since no such data exists for Proteorhodopsin and we don’t know whether the pigment persists through the night or “sleeps”. 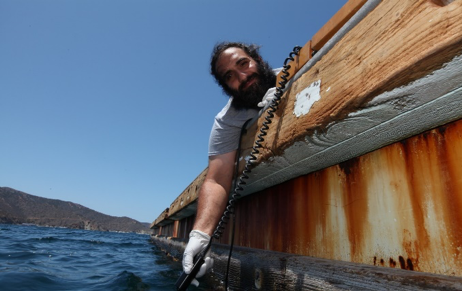 I am grateful to be awarded the Wrigley fellowship this year through the Wrigley Marine Science Center (WMSC) which allowed me to conduct research on Catalina Island, where there ocean and lab space coexist. For my fieldwork, I sampled seawater through diel cycles once in the spring (June 1-3) and once in the summer (July 31- Aug 2). The seawater was sampled off the dock at WMSC every 4 hours for a 60-hour interval (Figure 2). After collecting the microbial biomass, I used a new analytical method developed in our lab at USC’s main campus to extract and quantify the PR pigment using ‘liquid chromatography tandem mass spectrometry’. The results show that surprisingly PR is detected through both day and night sampling time-points. Additionally, variations of pigment concentrations between the two sampling seasons are more significant than within a diel cycle of a given sampling period. These results suggest that the composition of the microbial community (diversity and absolute abundances of microorganisms) may be the more important factor in shaping pigment concentrations. My results provide insights into the role of factors such as sunlight, synthesis, and degradation in controlling pigment abundances and distributions. Stay tuned for more fieldwork and analyses of my research! This entry was posted in Graduate, Wrigley Institute on October 19, 2018 by Jessica Dutton. What is this invasive really doing? ?